The Best Value for Money in Town GUARANTEED! 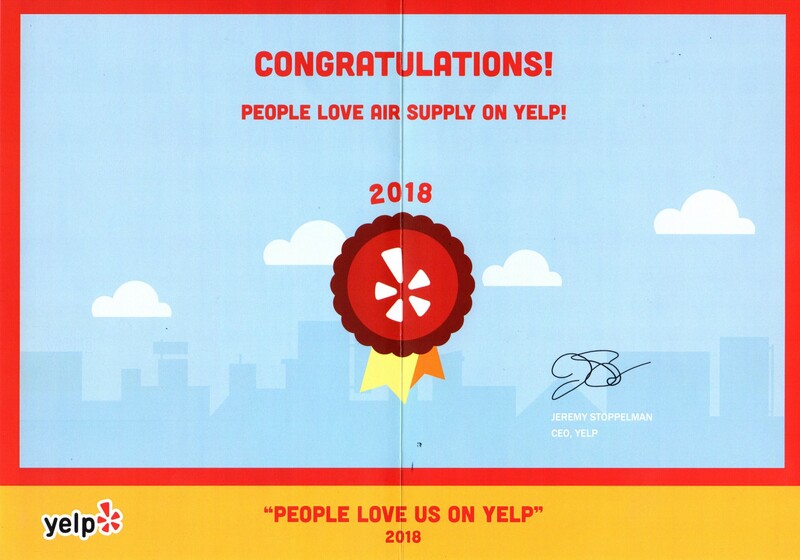 At Air Supply Heating and Air Conditioning, our priority is you, the customer. 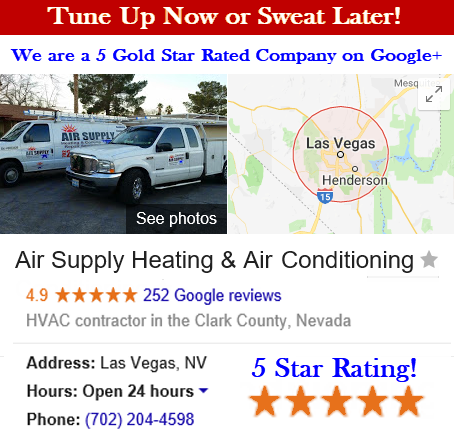 We are the full service HVAC and home comfort specialists serving Las Vegas Nevada and surrounding areas. We are here to help you create and maintain a healthy indoor climate and environment in your home or business. Utilizing our high efficiency and Energy Star rated HVAC and air filtration systems; you will live comfortably, use less energy and cut down on utility costs all year long! 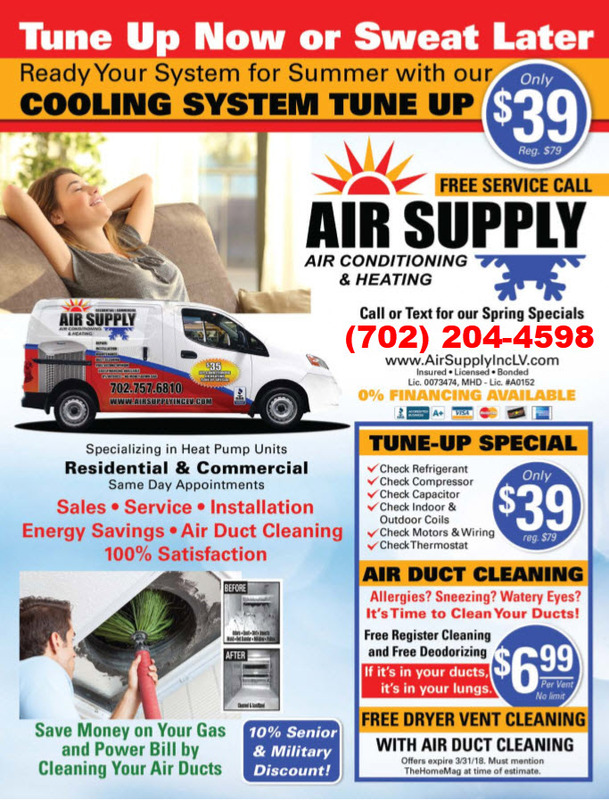 Contact Air Supply Heating and Air Conditioning today and talk to our helpful staff! 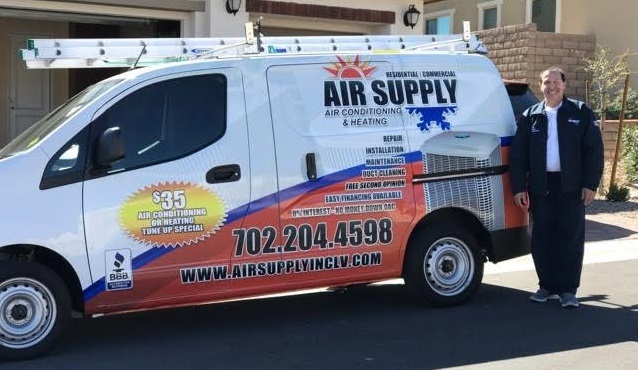 If you are not currently an Air Supply Heating and Air Conditioning customer, we welcome the opportunity to be your HVAC contractor of choice. And if you are an existing customer, we thank you for any referrals you have given us, appreciate your patronage and look forward to better serving you in the future! You can count on us for unbeatable prices, efficient service and reliable results! We provide heating and cooling services to many local real estate investors and have an A+ rating as an Accredited Business at the Better Business Bureau. We have thousands of satisfied customers who routinely refer us to their friends and families. Please see our Gallery Page for many examples of our high quality work. Contact us today and discover why we are a local leader in our field! Contractors Lic #0073474 and MHD License #A0152. When the weather starts to heat up, it’s a great time to schedule your spring air conditioning tune up before your air conditioning units kick into high gear in the summertime. 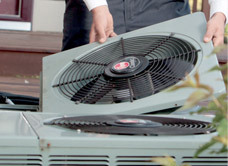 A pre-season cooling tune-up will provide your home or business with a wide range of benefits. Keeping your A/C system operating at optimal performance will increase the life of your air conditioning units. Routine HVAC maintenance provides early detection of potential air conditioning system problems and safety issues. Save money by increasing your system’s energy efficiency with a spring cooling check and call Air Supply Heating and Air Conditioning. Now is a great time to schedule your fall heating tune up. 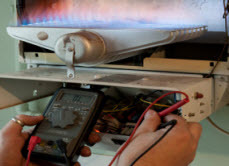 Furnace manufacturers recommend an annual inspection and maintenance tune up by a qualified technician like Air Supply Heating and Air Conditioning. We recommend it for safety reasons as well as preventative maintenance. We can help you catch a small problem before your furnace quits working in the middle of the night and you need emergency heating repairs or replacement! During the year, your heating system accumulates dirt and dust buildup which makes it less efficient and costs you additional money in power bills. After reviewing our heating service calls, we have discovered that about 2/3’s of these calls were due to a problem caused by lack of regular furnace tune-ups and maintenance. Call Air Supply Heating and Air Conditioning today to prevent costly repairs and to start saving money on your utility bills this winter! We offer a 100% Guarantee: all of our repairs are 100% guaranteed and backed by a part and labor warranty. In addition, our Maintenance Agreement customers save up to 20% on repairs and parts! 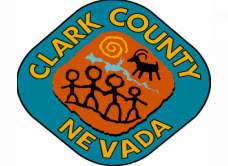 In the Greater Las Vegas area, temperatures can rise up to 115 degrees in the summer and have been known to drop to the teens during the winter. Most equipment failures occur during these extreme temperature periods. Contact us today and move yourself to the front of the line with a trusted Maintenance Agreement from Air Supply Heating and Air Conditioning! Regular maintenance of your air conditioner and furnace is a small investment that will give you a great return by keeping your system operating properly and cooling or heating your home effectively for many years. Don’t settle for other HVAC companies’ 15 to 20 point inspections. 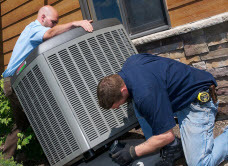 Air Supply Heating and Air Conditioning offers one of the most complete system inspections in the valley. Contact us to schedule our Desert Comfort’s 43 Point Inspection for your home or business and rest assured that your system will keep operating like it should! Las Vegas summers can be hot! But, there’s no sweating it when you have got a trusted HVAC contractor by your side like Air Supply Heating & Air Conditioning. We know the importance of keeping your home and business cool in the hot summer months. Whether you have just built a new home or office or are upgrading your system, we will provide professional air conditioning installation for your home or business in a prompt and professional manner. 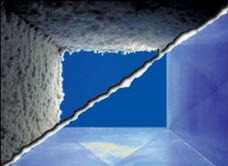 Indoor air pollution can be up to 70% more polluted than outdoor air pollution! People spend as much as 90% of their time inside their homes and office buildings, so clean indoor air is of the utmost importance for day to day health and comfort. Air Supply Heating and Air Conditioning can help the people that spend time in your living and working spaces be safer, healthier and more comfortable by removing any present mold and mildew from your duct work, lessening the amount of dust in your home, eliminating musty odors caused by a neglected system, improving uneven temperatures from room to room and reducing your utility costs! Local Resident, Army Specialist Justin Gulde Was Seriously Injured in Iraq serving our country and putting his life on the line to protect our freedoms here at home. 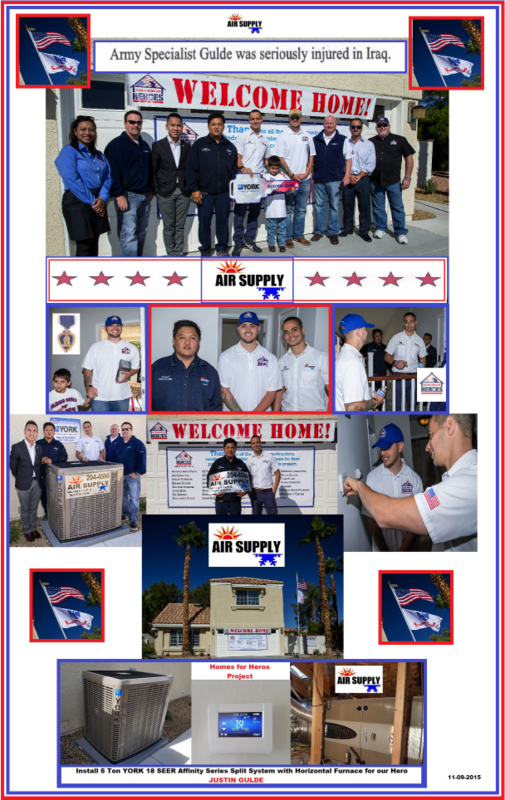 Air Supply was happy to partner with Homes For Heros to provide Specialist Gulde with a new HVAC System. All of us here at Air Supply are proud to support this brave warrior and invite all our customers to join us in saying thank you to our brave men and women that serve. We strongly believe that if it were not for the Brave, we would have no land of the Free.